Just in time for Rosh Hashana 5775, Clearwater Kosher, a project of Chabad of Clearwater, directed by Rabbi & Rebbetzin Levi & Miriam Hodakov opened for business serving both the Jewish residents in Central Pinellas county as well as visitors to Clearwater and Clearwater Beach. Clearwater Kosher, "Where Shopping is a Mitzvah", is centrally located @ 2280 Belleair Road - Clearwater, FL, 33764, just east of Belcher, and is also home to the Tabacinic Chabad Center. The store is open every Sunday from 10:00am-12:00pm, Thursday from 5:00pm-8:00pm, Friday from 10:00am-12:00pm. It is always best to call ahead in case of a schedule change. If the above times do not work, we will try our best to accommodate you please just call us @ 727-265-2770. 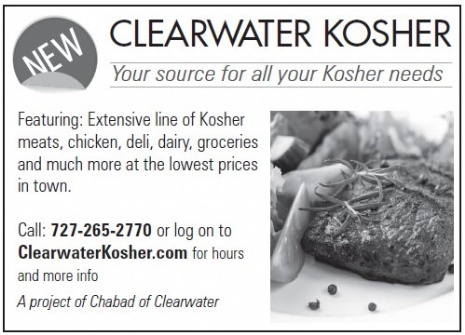 Clearwater Kosher features an extensive line of Kosher meats, chicken, deli, dairy, groceries, bakery goods and more. "Our goal is to serve the community and help make it easier to keep Kosher. To that end we are committed to keep our prices very reasonable and our overhead as low as possible. Shoppers will also be doing a Mitzvah each time they shop, as proceeds will go to further the programs offered by Chabad" said Rabbi Hodakov. "Most of our products, specifically the Kosher meats, chicken and deli could not be found in Clearwater. That will no longer be a problem" Hodakov concluded.